What's it like to live in the poorest part of the poorest country in the European Union? While concerns persist over how many Bulgarians and Romanians might move to the UK in search of work, some Brits have upped sticks and made the opposite journey. 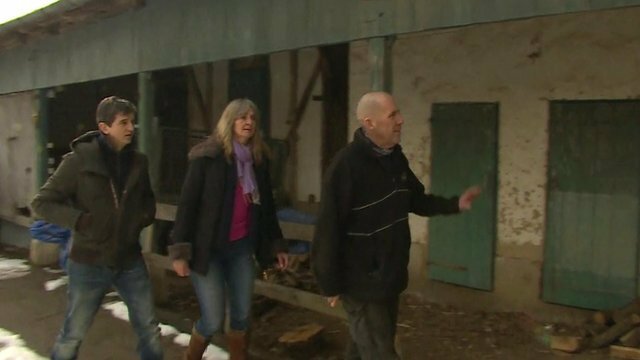 Amid increased restrictions in the UK on benefit payments for EU migrants, the BBC has caught up with one British couple who left their home in a quiet village in Rutland in favour of the snow-capped terrain of north-west Bulgaria. "The undertakers all seem to wear tracksuit trousers," says Kate Humphries, as she prepares a pot of coffee in her new Bulgarian home, nestled in the snowy hills of the poorest part of the poorest country in the EU. "In fact the ambulance crews also wear tracksuit trousers. Perhaps they're the same people," she adds, to a throaty laugh from her husband Terry. The couple moved to the village of Komoshtitsa late last year. It took them four days to drive across Europe, with their two dogs, to the house they bought in the remote, rural north-west corner of Bulgaria, close to the border with Romania. They've always liked village life, but this is rather different from what they've left behind. "The village that we came from in England was very twee. On the edge of Rutland Water. A very pretty Rutland village. Stone houses. All hedges cut beautifully - mostly by Terry." Komoshtitsa is not beautiful to look at. Potholes litter those roads that are tarmacked. Other lanes are either gravel or mud tracks. The buildings haven't seen a fresh coat of paint in years. Plaster crumbles off many facades. Rubbish lies along the roads. And there is real poverty here. Many are unemployed. Some of the villagers collect their water from a spring. So why move 1,625 miles (2,616km) to this? "We could do what we want to do. We could afford to do what we want to do. Bulgaria was the place," says Kate. What they could afford is a lot: the main house with several bedrooms; a barn, recently re-roofed; more buildings that, in time, can be converted; land for a horse, which one day Kate wants to buy; room for an orchard and more besides. All, as Kate says, "for around the price of a new family car in the UK". Their idea is to be self-sufficient in terms of food. "We will have to buy milk - I don't think we will stretch to a cow. Maybe a goat, or two, some chickens. We've got a vegetable plot over there." The yard next to the barn is full of chopped wood that's been keeping them warm through the winter months. All their heating is provided by a wood burner in the living room. "Less than £300 to heat everywhere" for the year, says Terry proudly. "That's good mathematics." Terry's used to chopping wood. He worked for the Forestry Commission. Kate was a housekeeper for a rich landowner for years, until she lost her job recently. They've never been in debt and have worked hard but they realised that, with both of them in their 50s, something had to change if they were to be able to afford their own home and live comfortably in the coming years. It is estimated that some 18,000 British people have moved to Bulgaria - many to take advantage of the lower cost of living. About half live here for part of the year, the rest permanently. The latest figures provided by the British government - and gathered by the Institute for Public Policy Research (IPPR) - are an estimate. They're the best guide we have as to where Brits who have moved abroad are living in the EU. Interestingly, they suggest that the number of Brits living outside the UK but in another EU country is 2.2 million - about the same as the number of EU citizens who are now living in the UK (2.34 million). "British people, for the most part, leave for work," says Dr Carlos Vargas-Silva, an economist and senior researcher at Oxford University. This migration, back and forth, is made easier by the European Union's policy on Freedom of Movement, part of the Single Market rules which allow any EU citizen to travel to another EU country to live, study, or look for work. The UK government's plans to restrict EU migrants' access to benefit payments are being examined by the European Commission to see whether they break the Single Market rules. 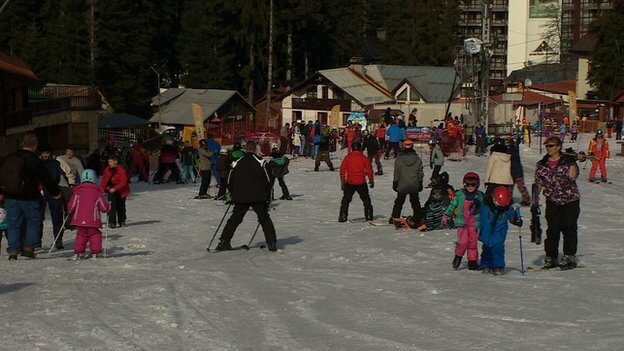 Meanwhile the ski slopes above the Bulgarian capital, Sofia, are swarming with children in yellow high-visibility jackets. It's unseasonably warm. The snow is melting, turning to sludge, making the going tough. A little boy slips over on the edge of the piste. "There you go, up you get," says another Brit turned semi-Bulgarian, offering a helping hand. Matt Pigden has made the resort, Borovets, his home for almost a decade now. He runs a successful snowboarding company here during the winter, and in the summer he heads down the mountain to a nearby lake where he hosts wakeboarding training sessions. "When I first came here, before 2007, before Bulgaria was in the EU, we had to register with our local police station, you could only stay here for a certain amount of time." Since joining the European Union it has become a lot less bureaucratic. "Now I've got a Bulgarian citizen card. I'm registered in Bulgaria. I have a European ID card on top of my UK passport. It's easy," says Matt. "The single labour market is not the key factor that decides the destination," argues Dr Vargas-Silva. People "are looking at wider factors than that". So many Brits have moved to Bulgaria - a country of only 7.3 million people - that it has inspired a comedy TV series. The English Neighbour was originally a popular book written a few years ago. 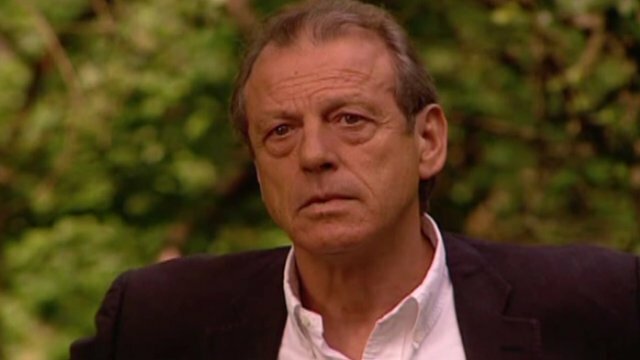 In the TV version, the Englishman who moves in is played by the former EastEnders actor Leslie Grantham, aka Dirty Den. For the real "English neighbours" of Komoshtitsa, the move is a chance to reset their lives. "I didn't even know where Bulgaria was at first. I certainly didn't know it was in the EU," says Kate Humphries. They are still grappling with the language and no-one in the village speaks particularly good English but, they say, they do not feel isolated. "Just the opposite," says Terry. "You walk up the street and everybody speaks. In England you walk up the street and sometimes people wouldn't speak." Kate says things had changed so much back in Rutland that they needed a new place to call home. "There were seven farmers in that village when we moved there 30 years ago. There are no farmers there now. This is a farming community... with a slight drinking problem," she adds, to that infectious laugh from her husband.